Fantastic 8’s Review – Why would anybody want to adopt a horse racing betting system that was deemed as being high risk? Fantastic 8’s would definitely fall in the high-risk category and yet we would recommend it to those of you that understand variance and bankroll management. Read on to discover why. Here’s why Fantastic 8’s has gained such a great reputation. Fantastic 8’s outshines almost all other rivals, when it comes to profitability. While their winners are less-frequent, this is more than made up for by the winning odds – often as high as 33/1 or more! Since inception in March 2015, Fantastic 8’s has returned a profit of 2990.20 points to advised stakes. That means if you had backed all of their selections using £10 units to their advised stakes (advised stakes range from 1 to 5 unit bets), you would be over £29,000 ahead! Look at the graph below to see how it is currently on a consistent upward curve. Fantastic Eights has proven to be our most consistent and one of our most highly recommended tipsters over the past 12 months or so (along with Lucky 7 Naps and Quentin Frank’s Racing). 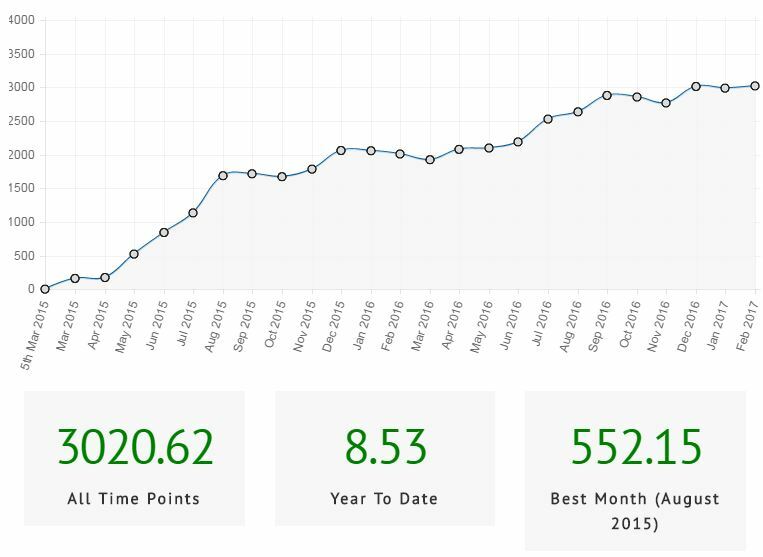 You can see from our 12 month Pro Tipster portfolio experiment how much we made following Fantastic Eights plus 2 other tipsters for a full year here to £1o stakes. What starting bank is required given their strike-rate? A high one! Fantastic 8’s is not for the faint hearted. Their strike rate is only about 20% (one winner in 5). This means mathematically the worst losing run that you can expect is 30 races, when an extremely bad down-swing kicks in. A suggested bankroll of 93 units is the smart way to go if you are planning to bet using flat stakes. That means you will need £930.00, if you want to make £10 bets, right from day 1. This service is not for the feint-hearted. The strike rate is low but the ROI is 25%. So if you hate losing runs or you tend to chase your losses, then this service is not for you. Only disciplined bettors with a solid understanding on bankroll management should sign up to this service. We also recommend a minimum of 3 months subscription to get the best out of this service. How were you introduced to betting and when did you decide to take it seriously? My dad used to like the horses so I have grown up with his knowledge passed down. I have therefore always carried an interest in racing but started to take it seriously 6 or 7 years ago when the internet enabled data collection to become so much easier. What do you think is the key ingredient to your success? I am totally dedicated to this, I record everything and analyze all my results in order to try and improve all the time. Can you remember some of the big mistakes you made in the past when you first started betting? I think the biggest mistake we all have probably gone through in our betting is to try to chase our losses. I stick to a strict staking plan now and never waver from it when using my method which enables me to keep control of my betting bank. Do you specialise in specific races/race conditions. If so, can you explain why? I make my selections when the markets are properly formed at around midday. I find this when the Bookmakers are at their most competitive so as a result there will be value to be found. I combine this with selecting from smaller fields of around 8 runners or less which is where my system has an edge. Why are you selling your tips if you can make money backing the horses yourself? When I realized how good this method was the first thing I wanted to do was share it with people. I started emailing my friends the selections and built up quite a following. Tipster planet then came about so I started proofing the selections to them and the rest is history. I think anyone can find a system or method which suits there style of betting. Personally I would advise someone to concentrate in one aspect of a sport and learn/research all there is to know about that aspect and then develop something around that. IE; Over 2.5 goals in the Premiership or say handicap races at Lingfield. Once you have found success in that then you can use the experience in other aspects. Or you can follow a tipster but research and study there results first then ensure you also follow a strict staking plan and record everything. What’s the most rewarding thing about running your own tipping service? Everyone wants to be successful so if the service stays at the top of Betfan’s top ten then I would like that but mostly I want to make a profit for my subscribers and that would be rewarding enough in itself. How much work do you put into horse racing every day? I spend 2-3 hours a day making selections and watching the replays and recording the results. We know that one of the biggest problems with winning bettors is keeping your bookmaker accounts open. Any advice on how not to get your bookmaker accounts closed down. This is difficult because they all react differently to certain betting patterns. I always advise to open lots of accounts and keep your stakes reasonable. When possible use the exchanges for larger bets. I love walking the fells in the lake district and my dream is to retire there.